Recommendations of healthcare services from members of the British High Commission, European Union (Delegation of the European Commission in India) and The British Council. She qualified as a doctor at the All India Institute of Medical Sciences, New Delhi in 1990. Thereafter, she trained and worked in the United Kingdom as a General Practitioner (GP). Further to her return to India, she had worked as a GP in various settings including a nearly decade long engagement with the British High Commission. At the British Medical Centre, she had provided complete family healthcare services for the Diplomatic staff and families of the British High Commission and other Diplomatic Missions. During this time, she was also engaged as Medical Officer for UK Visa Immigration health checks. In the Indian sector, she has been engaged in preventive health checks, outpatient care and corporate health services. She is deeply interested in providing high quality comprehensive GP care through routine consultations for all age groups. 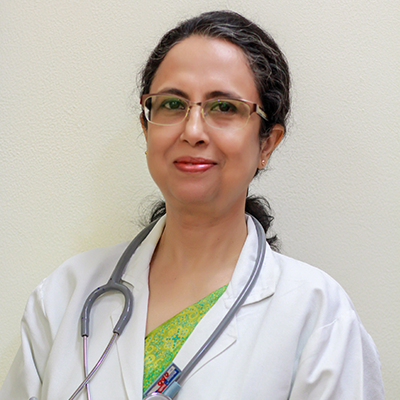 She has been caring for ailments such as fever, chest complaints, ear problems, gastrointestinal infections, childhood immunizations and developmental checks, women’s health checks including Pap smears, management of chronic diseases and emphasis on preventive aspects of emotional difficulties, routine health checks and premarital counselling. Member of The Royal College of General Practitioners (UK).